7 days on Block. Sounds heavenly, doesn’t it? True to form, this summer’s weather brought us a bit of everything. Hot and humid, clouds, fog, rain, winds, calm, sun, dry. What more could anyone ask for? 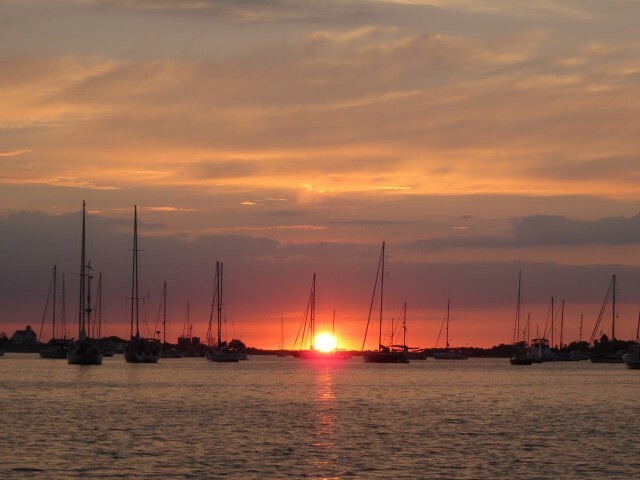 At Shennecossett Yacht Club, we spent the night on our mooring, away from the dock. 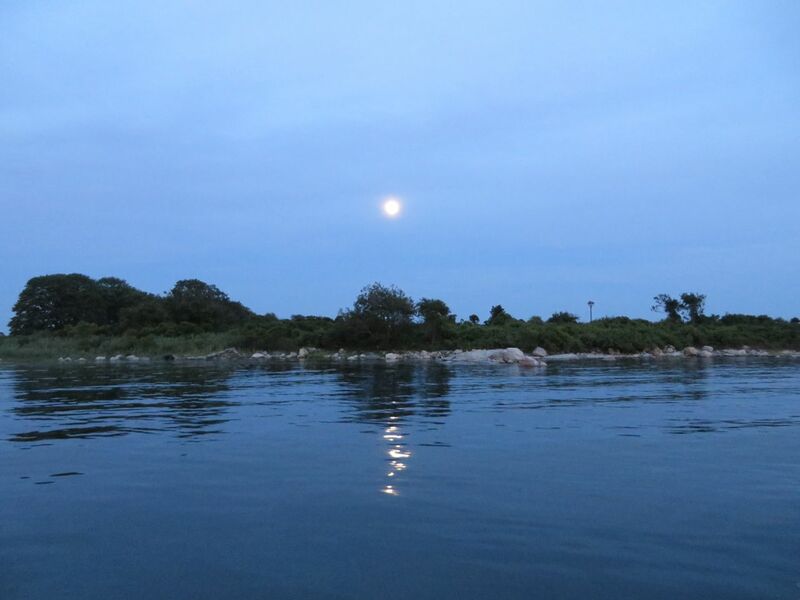 The sun set over SYC on one side while the moon rose over Pine island on our other side. 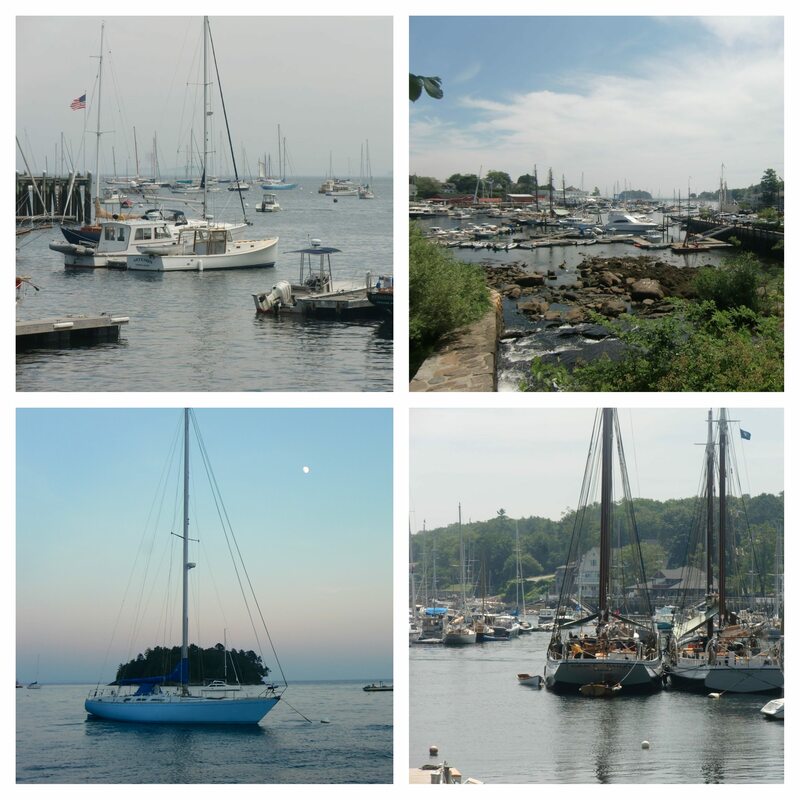 Home port can be just as lovely as distant shores. Anchoring was a challenge over on the far side near the restricted and clamming area. It took us three tries! The CQR plow anchor wasn’t holding the mud, so we switched to the Danforth and it caught. After that arrival, we just relaxed – we were here! There’s nothing better than sitting in the cockpit and just watching the sights, new and old. 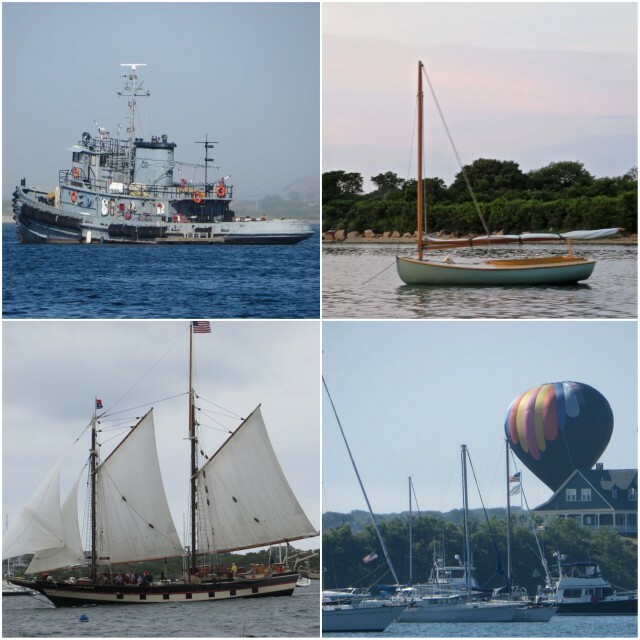 The big gray tug, a lovely little sailboat anchored off of Breezy Point, the Mystic Whaler, and a hot air balloon that never got any higher than this. Tuesday, July 23 – Clouds and rain were predicted (what a surprise), so we went to town. We wandered around, looking at changes since last year. We stopped at the library so Al could use the wifi with his iPad (couldn’t get a good connection on the boat.) While he surfed and checked his mail, I went to the library’s basement where they had discarded books for sale- 50 cents each or 3 for a dollar. What a bonanza! Bought 6 books, all guilty pleasures (crime and legal stories by authors like Jeffrey Deaver, Steve Martini, and Steven White.) At that price, no guilt involved! The Empire Theater, built in 1882, is a family owned business and is at risk of closing down unless it can convert to digital projection by Labor Day, 2013. They need to raise $55,000 dollars for the equipment. I remember going to the movies there many years ago. If there had been a decent film playing this week, we would have gone again. Wednesday, July 24 – Hurrah!! Finally a beautiful day. Yeah! – a beach day. Packed the blanket, towels, umbrella, sunscreen, books, lunch and off we went. Most people had the same idea and the beach was a colorful sight with umbrellas. But alas, the beach was much shorter since Storm Sandy. 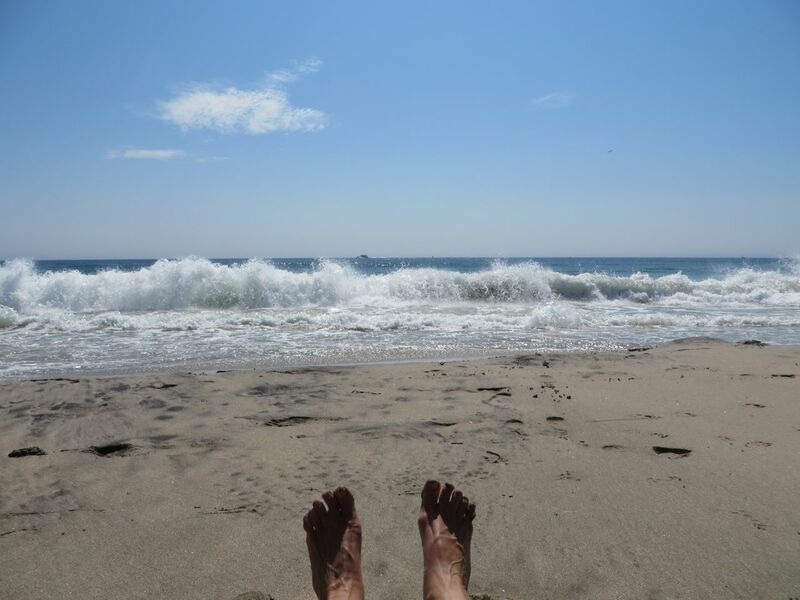 We sat there, listening to the sound of the breaking waves on the sand, and watching the waves come in threes. The water temperature was nice, not too cold, so swimming was a delight. Back at the boat again, there are chores to do. 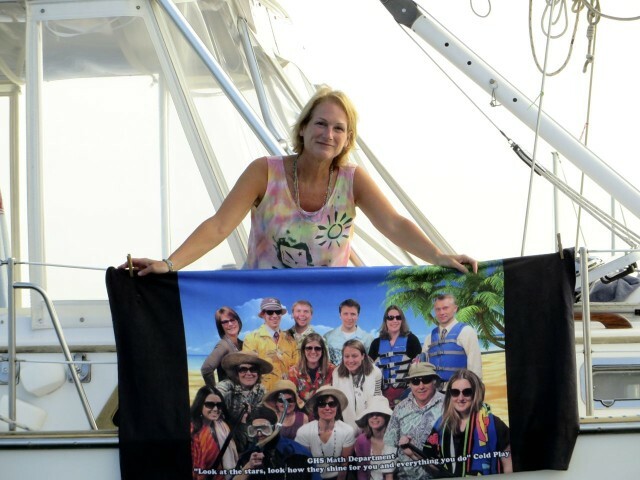 Scrubbing the sides of the boat and hanging towels to dry. There was a free concert sponsored by the BIRA (Block Island Residents Association) at the Fred Benson Town Beach. 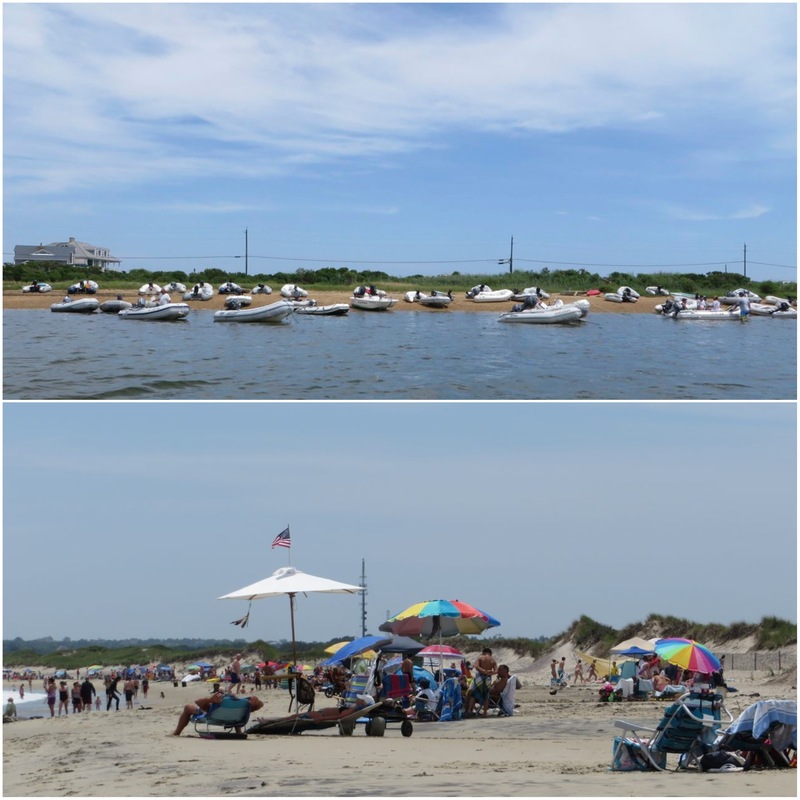 We packed drinks and snacks and dinghied over to “dinghy beach” again. Walked to the town beach from there and settled in. 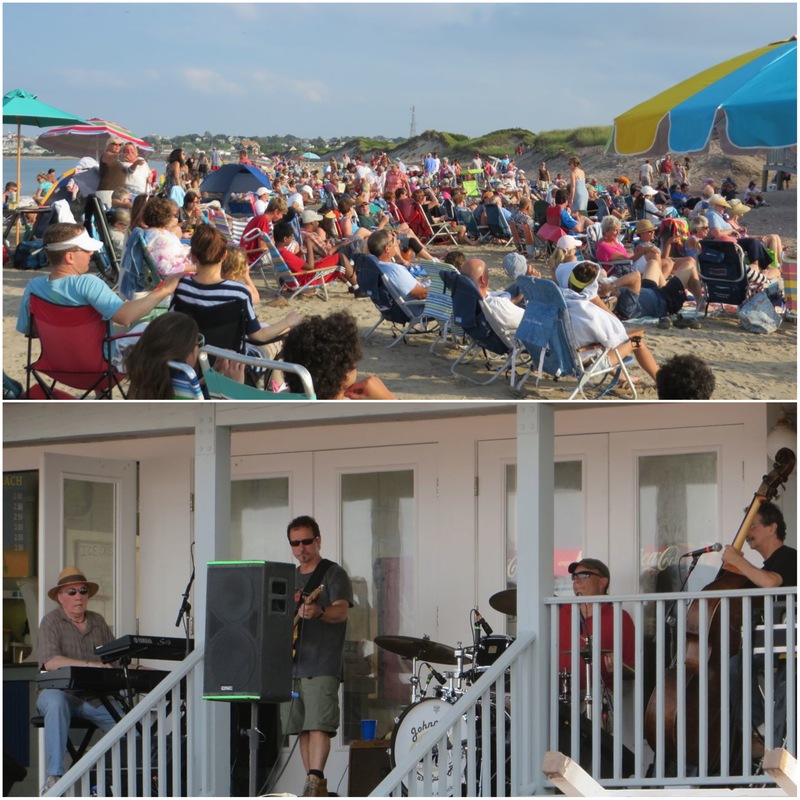 BIRA, Block Island Residents Association, sponsored the concert – Johnny and the East Street Rockers from Warwick, Rhode Island. 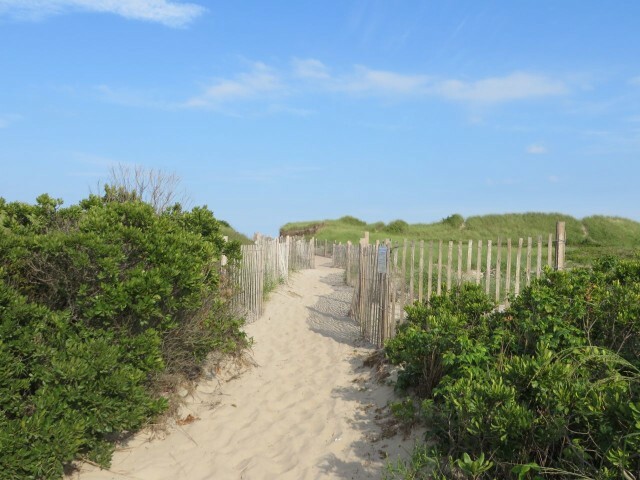 The association’s dune restoration project provided the funding and labor to put up a mile of fencing to protect the dunes that had been damaged by Sandy. There was quite a crowd watching, listening, and dancing. On our walk back we were treated to a beautiful Block Island Sunset once again. You never really tire of Mother Nature’s beauty. 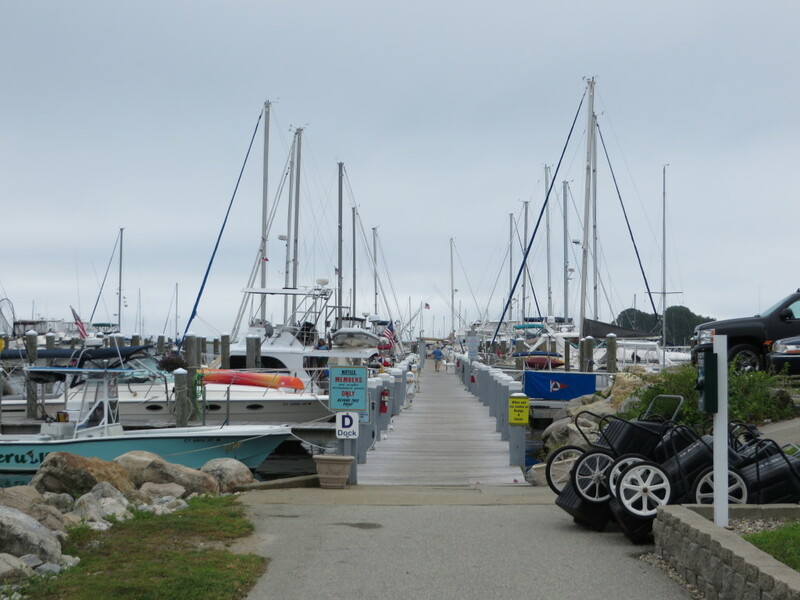 Thursday, July 25 – Back to an overcast and very windy morning. We planned to move to the SYC mooring today for the rest of the week (3 day maximum stay). It took a while to get both anchors up. The rope line of the Danforth was wrapped around and around the chain of the CQR. Thank goodness for Al – he can untangle anything. He untangled and pulled while I maneuvered the boat. 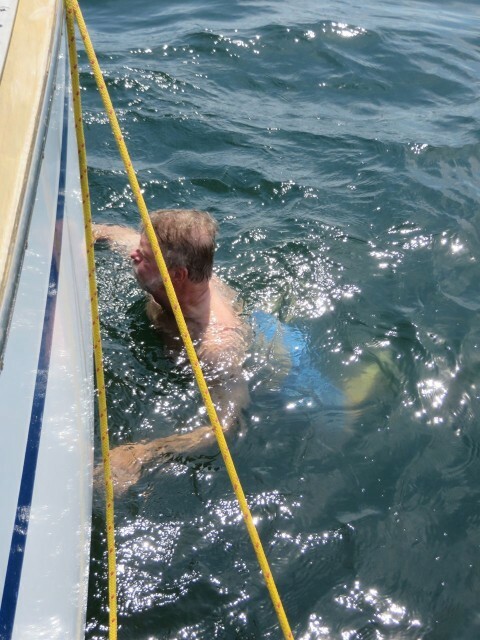 Nothing was going to be easy this trip – took me three tries to grab and pick up the SYC mooring- very windy and choppy. 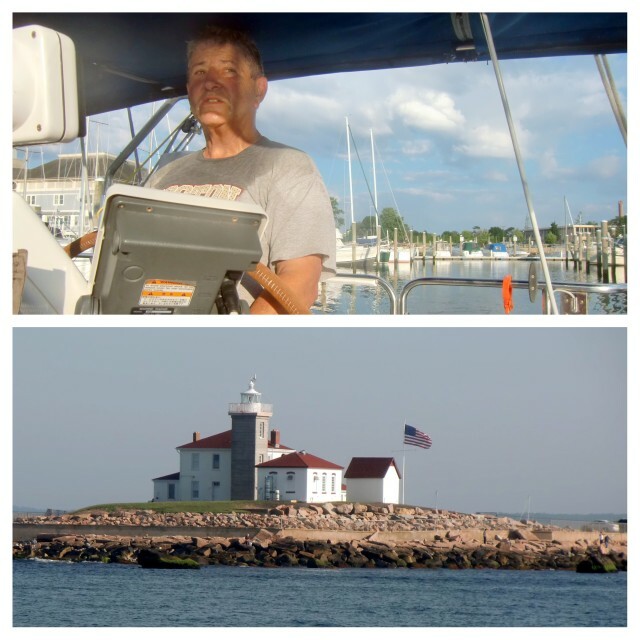 We spent the day on the boat working with the Garmin 5212 chartplotter and the Garmin Homeport software on the Mac. With no manual and no guidance to the software, it took trial and error to figure out anything! How can products be marketed and sold with so little direction? Frustrating, but the time passed quickly and we did learn a lot. What do you do in the fog and rain? 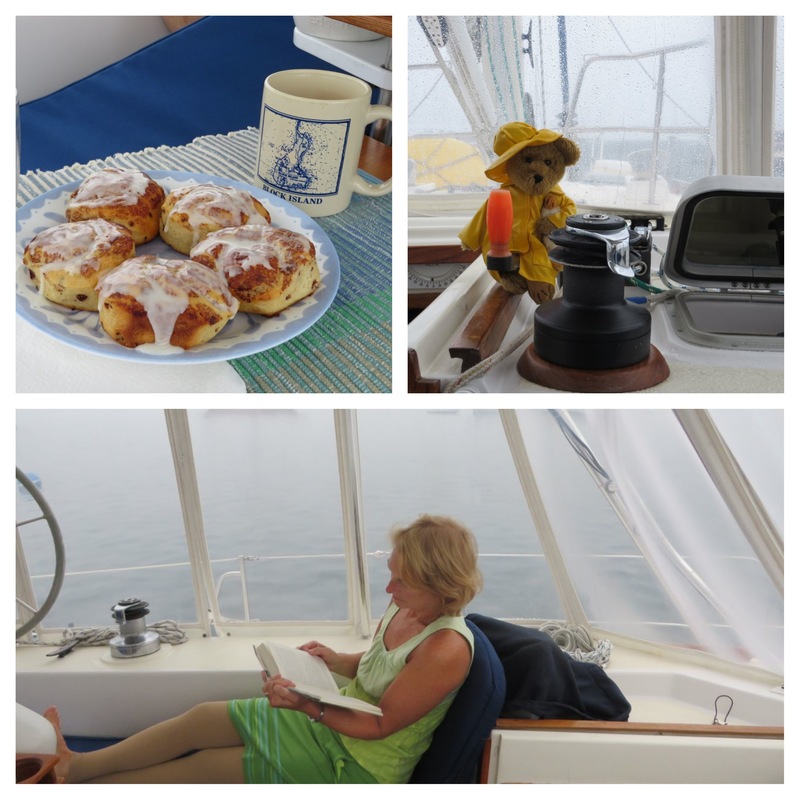 Bake cinnamon buns, bring out the rain bear and read! Friday, July 26 – More rain and wind. Couldn’t get off the boat all morning. 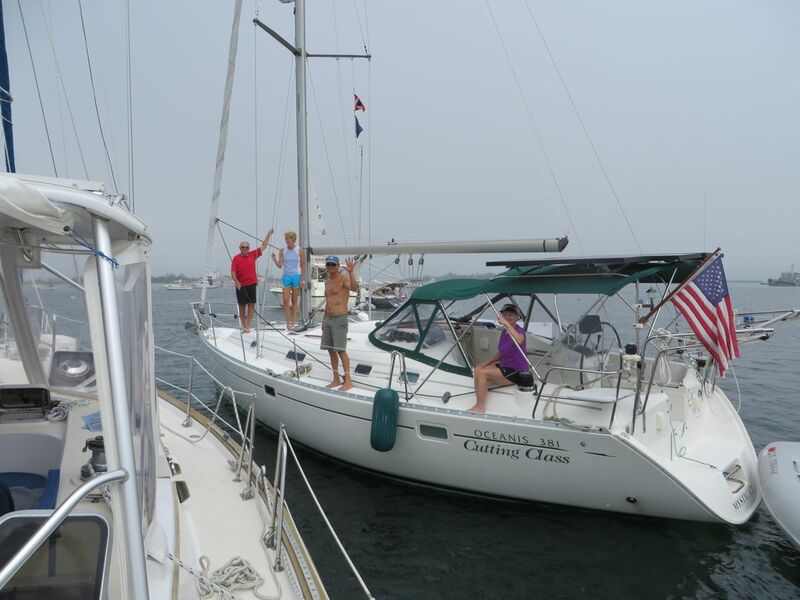 Now we are really feeling “boatbound.” Dan and Marcia (Cutting Class – yes, retired teachers!) were on their way to Block for the weekend. Yeah – company! Rafting two boats on a mooring in the wind is not ideal, but Dan and Al managed to it accomplish it safely and quickly. 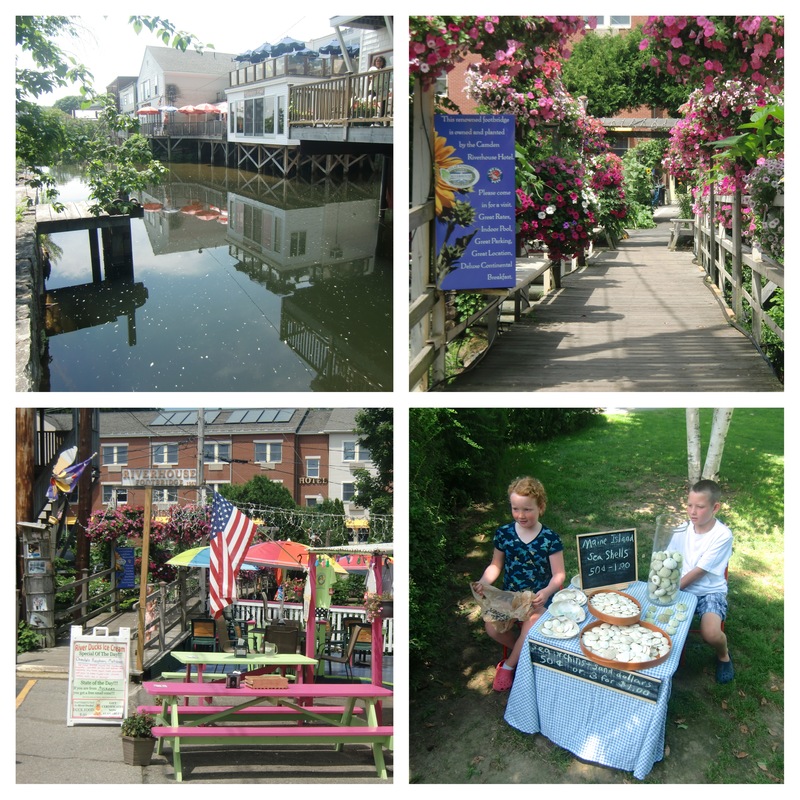 Saturday, July 27 – Hurrah! Another day of sunshine and no humidity. 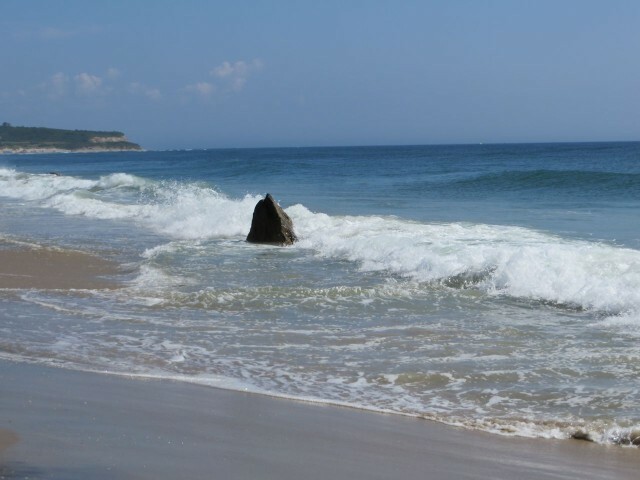 Obviously going to be a beach day! 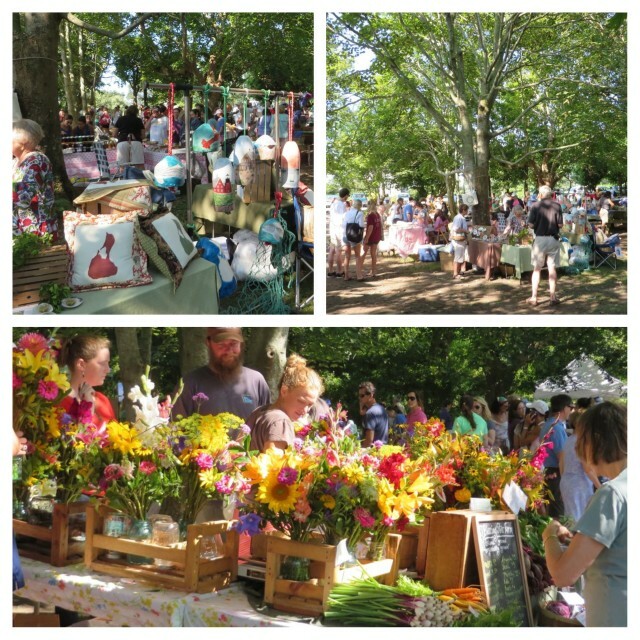 But first we walked to Negus Park for the Saturday Farmers Market. Local artists of all mediums were displaying their talents – painting, pottery, metal work, sewing, jewelry, baking, cooking preserves, floral, herbal, produce. 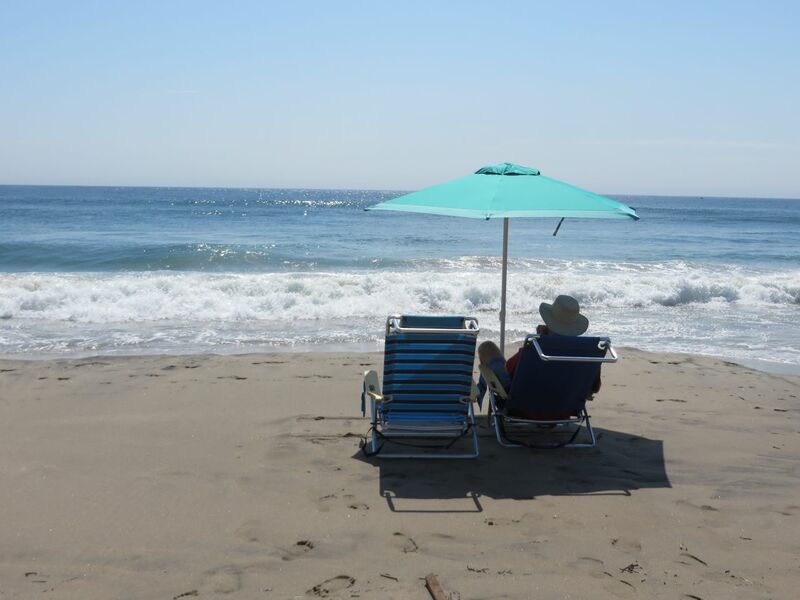 One of my favorite things to do on Block Island. Nice way to spend a Saturday morning. We spent the afternoon on the beach, swimming and walking, and watching people and ocean waves. Although we intended to go to The Oar for dinner, Cutting Class and Kindred Spirit enjoyed a happy hour together that morphed into a potluck supper. 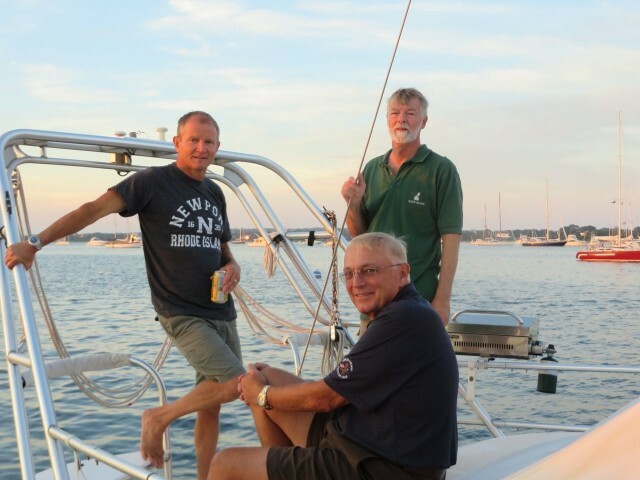 This is what sailing and cruising is all about – people and places. Al, Dan, and Rich enjoying a nice evening on the back deck. 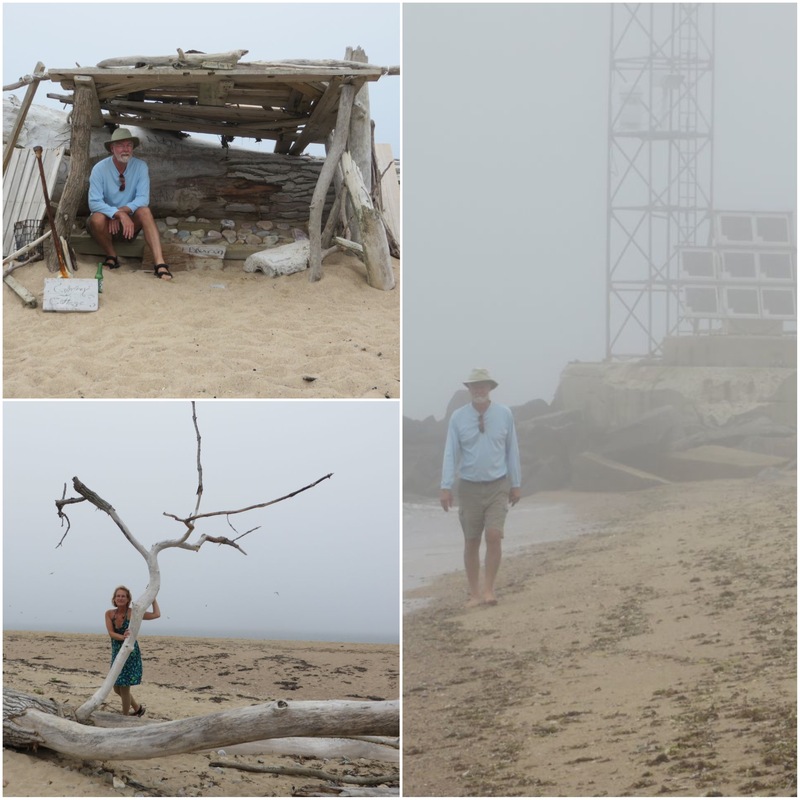 Sunday, July 29 – Foggy morning (I feel like that is all I ever write, fog, rain, fog, rain…) We took a walk on the outside beach of the Coast Guard Station. Someone(s) had built a little “shelter” from driftwood and named it Confrey Cottage. 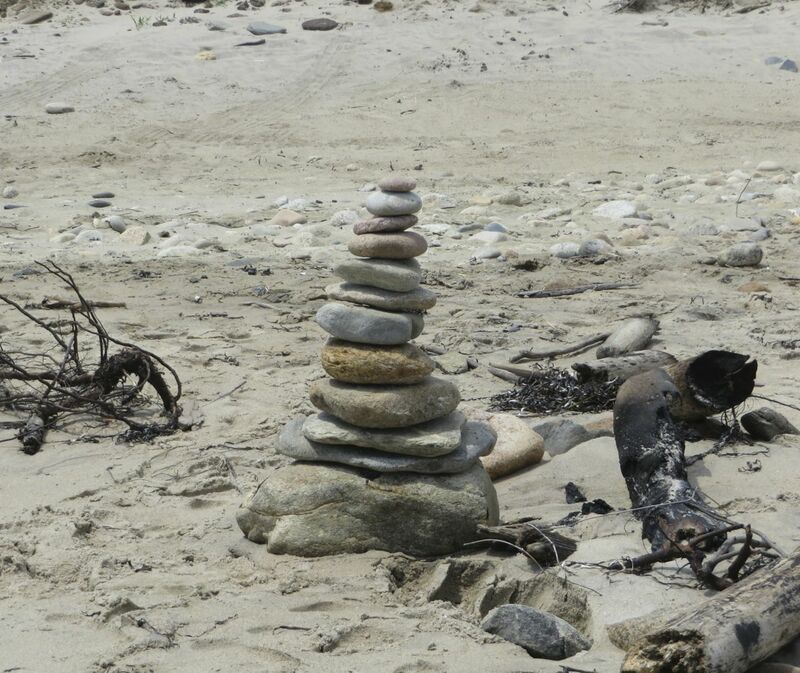 The inside was layered with stones on which people had written their names and the date. Wish we had a marker pen with us! 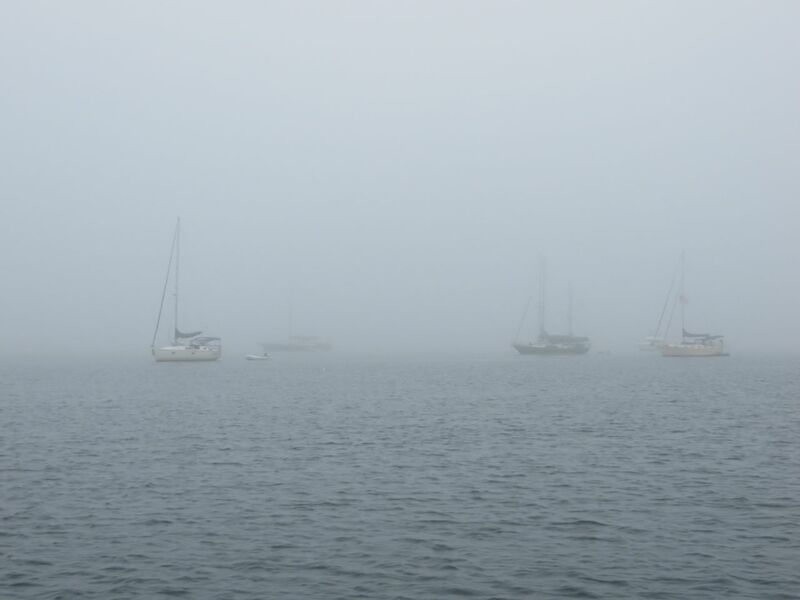 We said goodbye to Cutting Class and headed out into ….. yes….. FOG again. We needed the radar in Salt Pond and when we left. A small boat sailing near us contacted us on the VHF to ask if they could follow close by since they had no radar or GPS. Of course! We kept them in sight until the fog finally cleared and we parted ways. 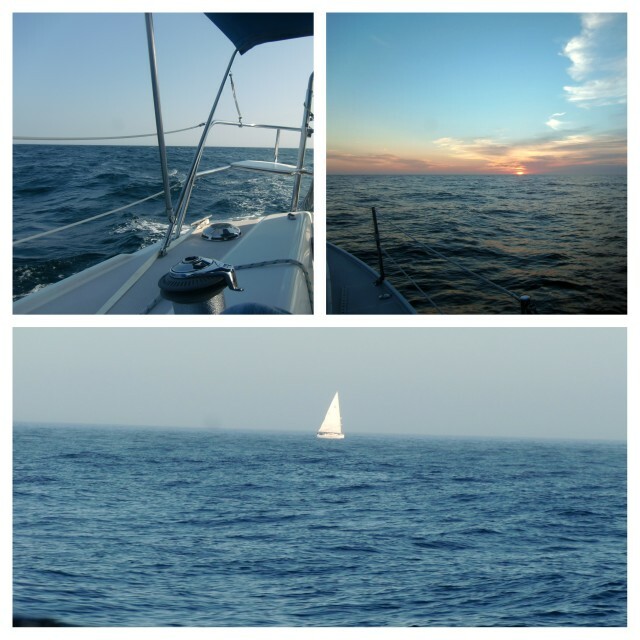 Once we were back in Fishers Island Sound, the day became sunny and we enjoyed a nice sail home. 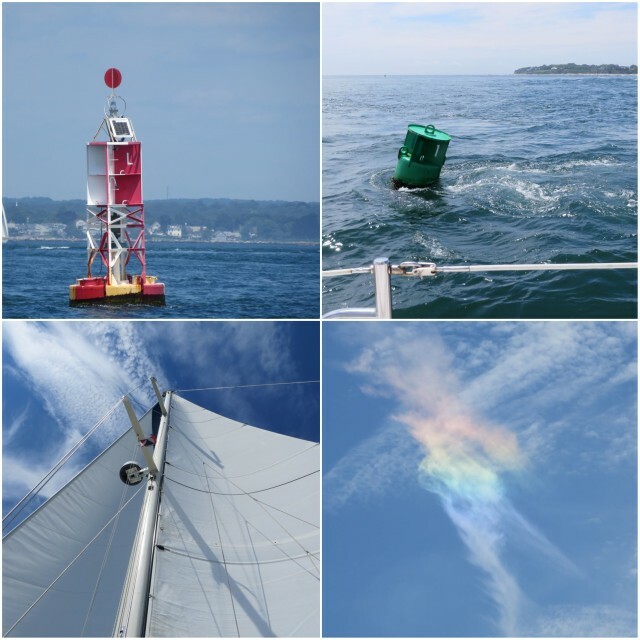 Yes- that last photo is really a very colorful cloud in the sky. What a cloud that one is! The “guys” went on a road trip by sea. 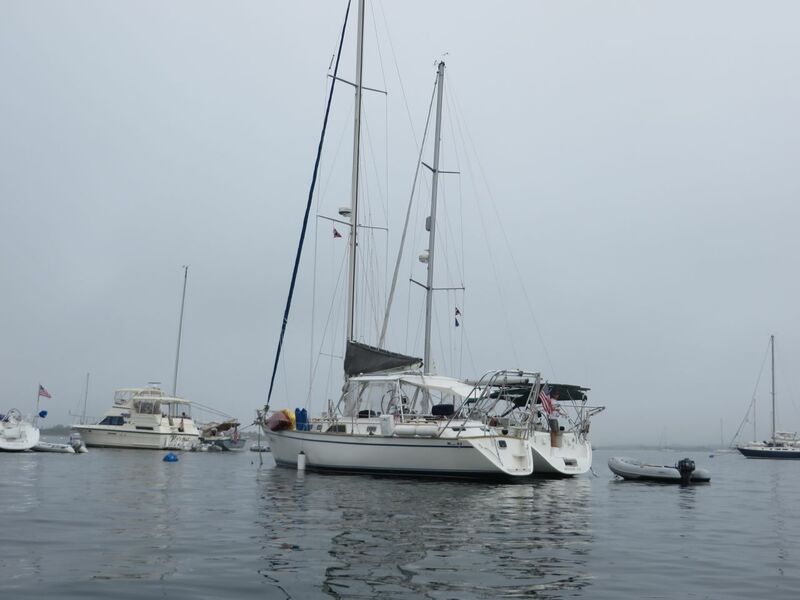 Al’s friend, Gil, needed a crew to help him take his 32 foot Catalina to Camden, Maine, where his wife, Judy, would then join them, by car. 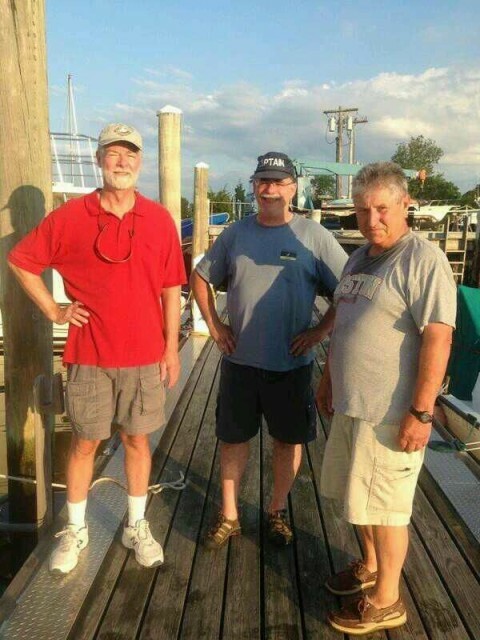 The crew of 3 (Gil, Al, and Walter) left SYC early on Monday, July 15th, the 2nd day of a 7-day heat wave here in Connecticut — high 90’s and humid every single day. TOP – Captain Gil at the helm, leaving SYC behind. 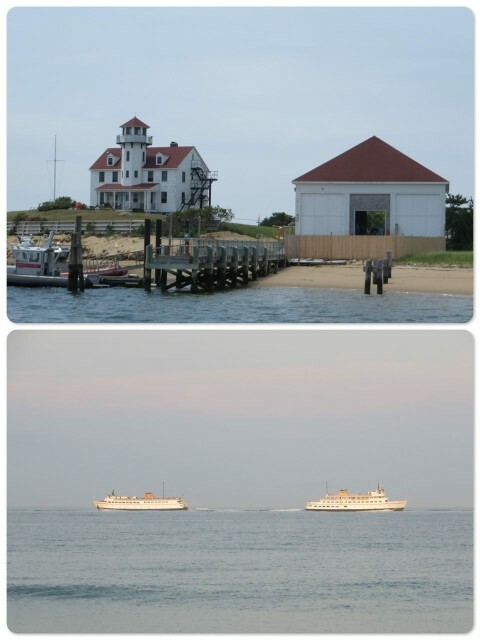 BOTTOM – Passing Watch Hill Coast Guard Station. The first day of 10 hours of motoring brought them to Cuttyhunk Island. 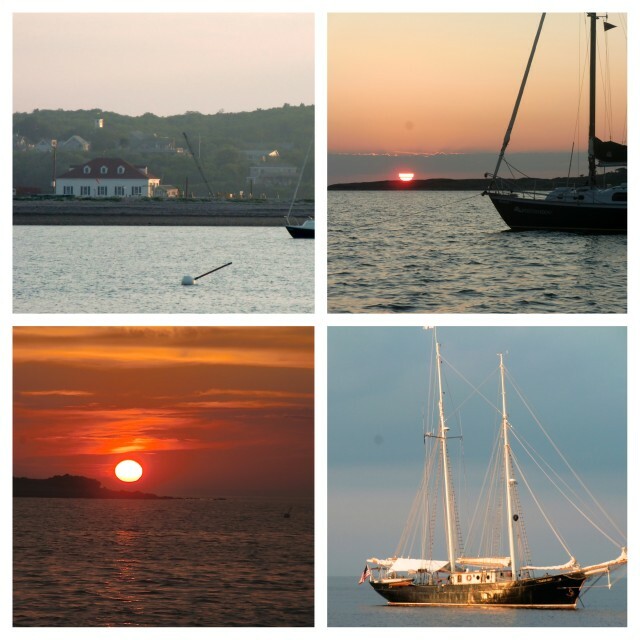 CLOCKWISE from upper left – Coast Guard Station at Cuttyhunk, Dawn, Sunset, morning light on the hull. Second day was a short one up Buzzards Bay to Onset. 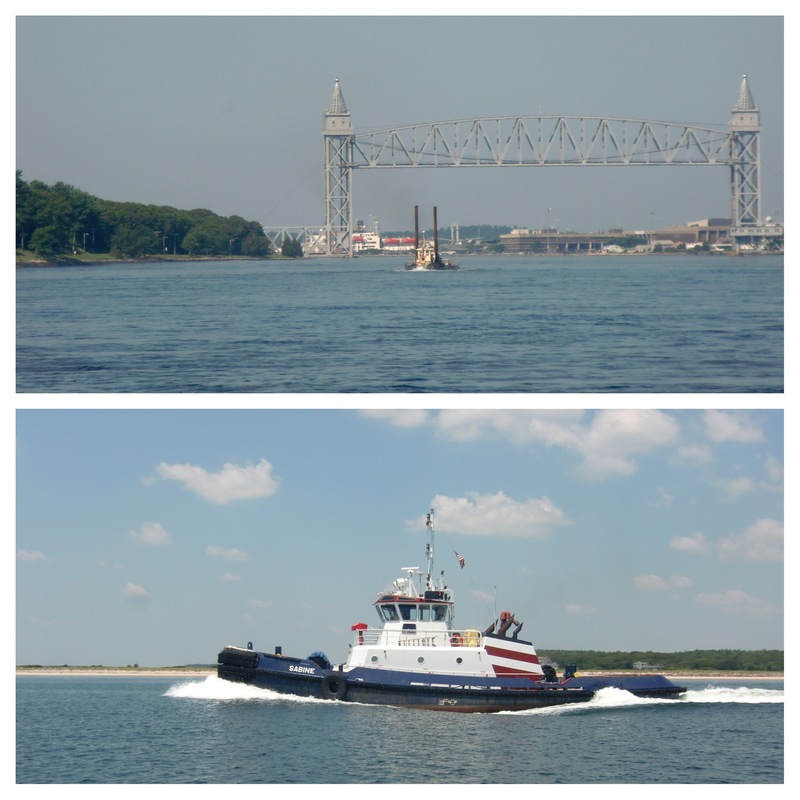 After a night in Onset to refuel, it was time for the Cape Cod Canal. Timing is everything in the Canal – catch the right current! Leaving Onset was the beginning of the long leg – 33 hours. Once through the Canal and past Provincetown, the sails went up. The evening began calmly, but everything changed around 10:30 pm. The seas kicked up to 4 -8 feet, followed by thunder and lightening. There they were, on a small boat with a mast, the only tall thing around for miles. Al found it fascinating to watch the lightening strikes on the water, but was always conscious of just how dangerous this could turn out to be. Once the heavy rain began, the seas flattened, making things a little easier. That new foul weather jacket was put to good use. There are no photos of the journey through the night. Morning came and so did calmer conditions. 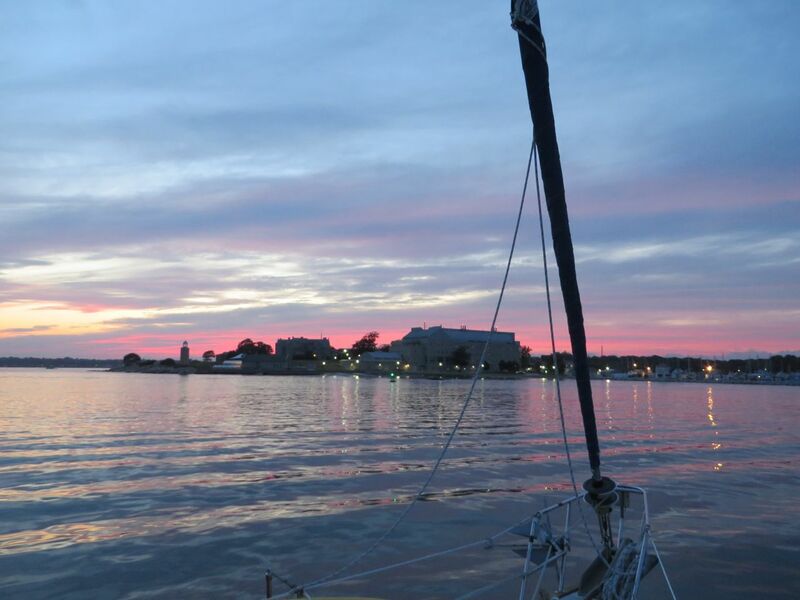 The sail boat in the distance was a happy sight – where did they come from and what was their night like? 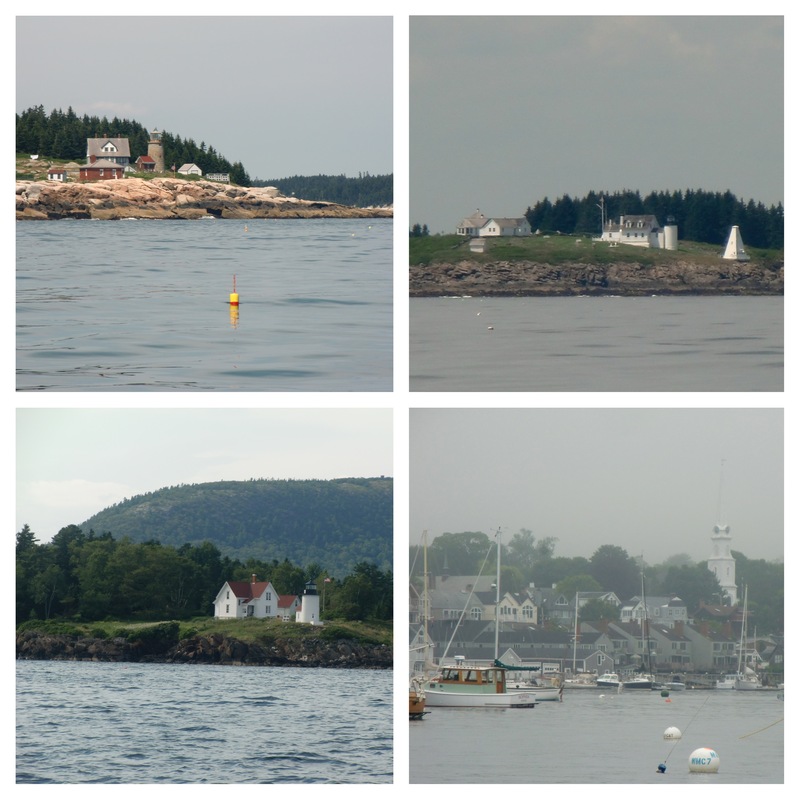 The coastline of Maine appeared, as beautiful as people say it is. 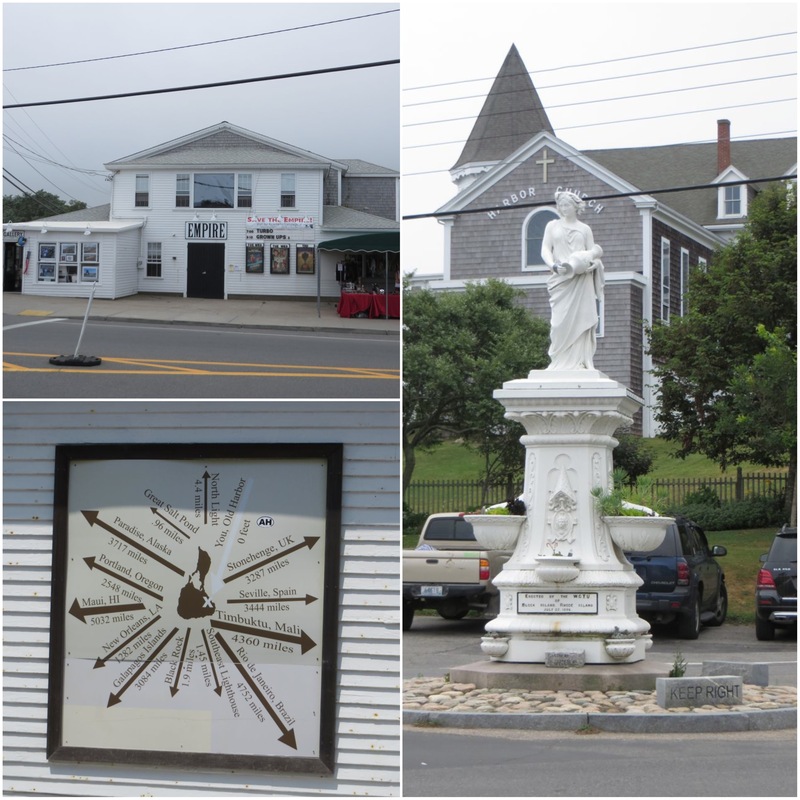 A few scenes from the town of Camden. Don’t you just love the young entrepreneurs in the lower right? 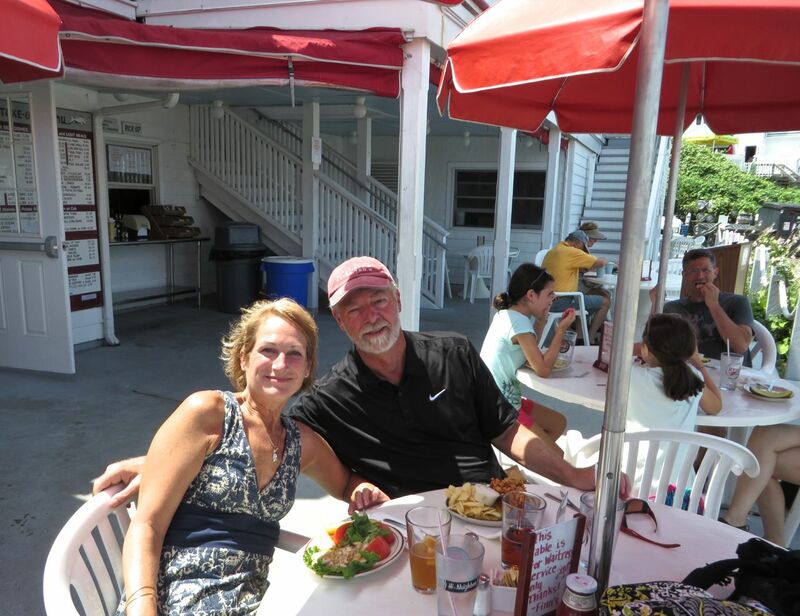 Al supported their business by purchasing 2 sand dollars and 4 pieces of sea glass, for $2.00 total. That is my favorite photo from his entire trip. 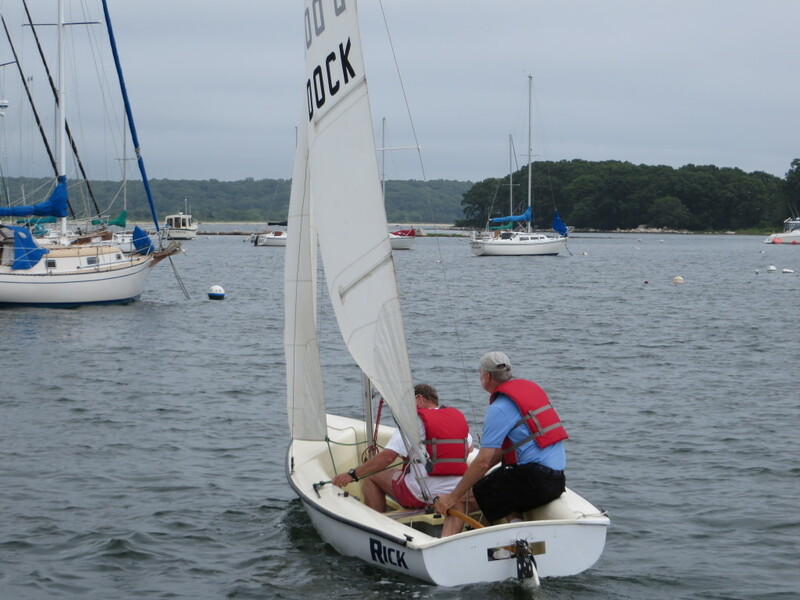 SYC (Shennecossett Yacht Club) held it first “Dock Races” on July 13th. 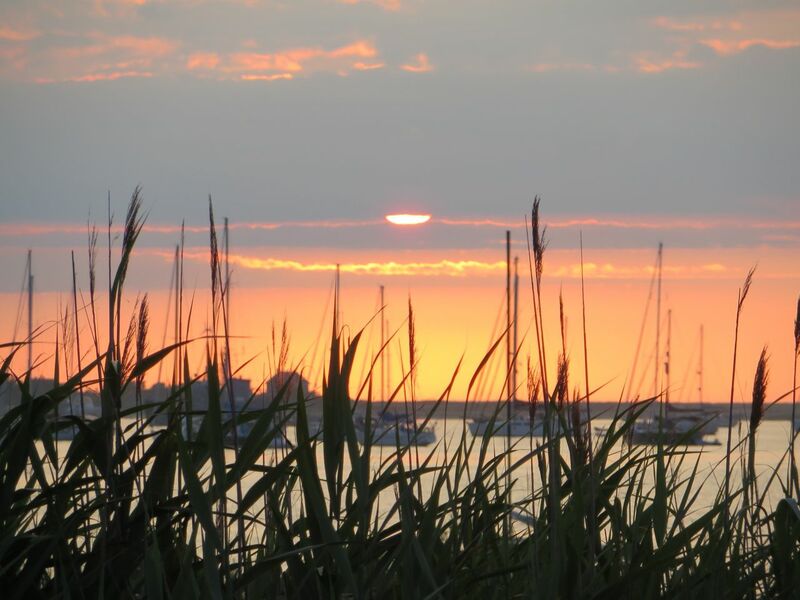 The day was typical of our recent weather, changing from moment to moment – cloudy, sun, downpour, humid always. 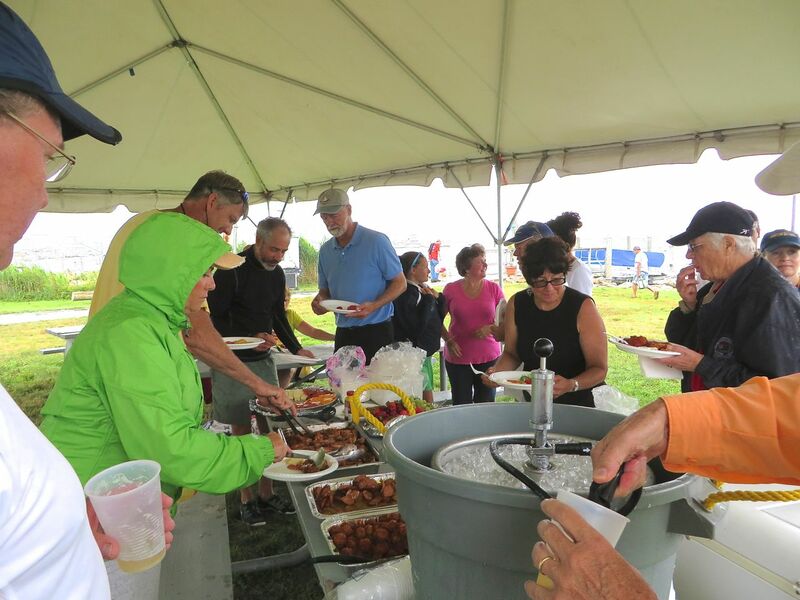 Fortunately, the downpour waited until after the racing was finished and we were all under the tent, eating. 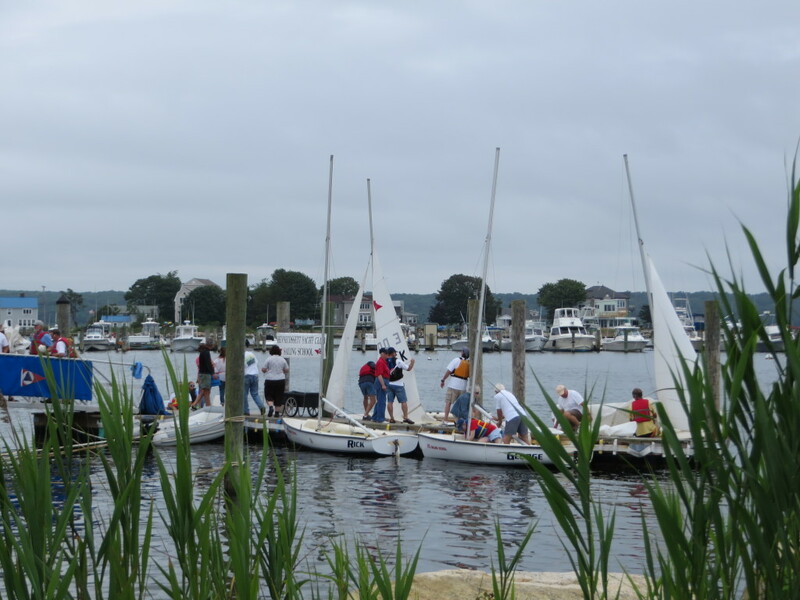 Each dock had teams of two-person crews, a sail boater and a power boater. This sounded like a great way to bring rag baggers and stink pots together for some fun. 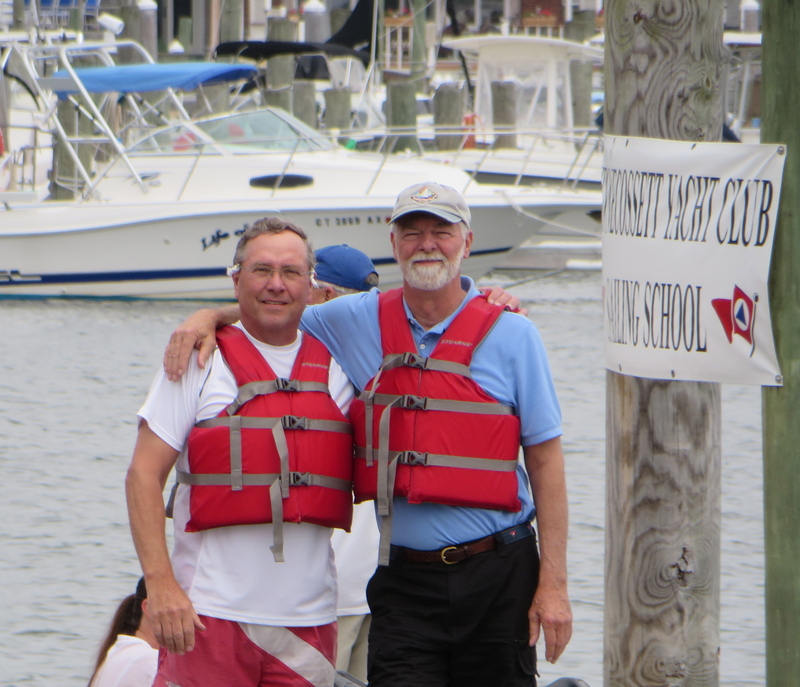 Al and Dean, already a “hybrid” friendship, signed up for D Dock. 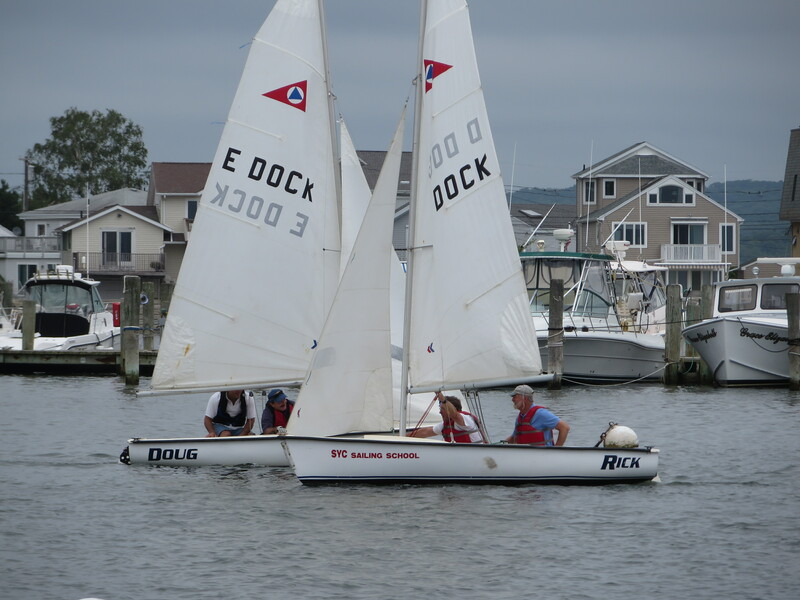 The race was run as a relay with two boats from each dock with staggered starts. 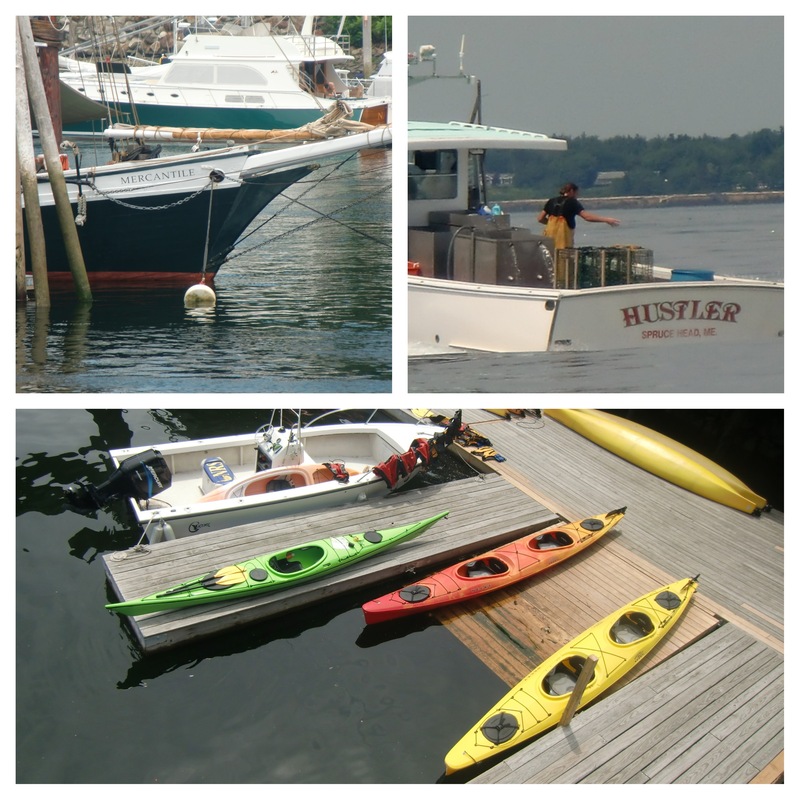 Each boat was individually timed to determine the winner. The course was short and the whole race lasted only 20 minutes! 🙂 The crews and spectators had such a good time that everyone voted to have a longer course for next year and to encourage more participation (especially the power boaters!) After the race, we all gathered for food, race analysis (even a short race has to be analyzed!) and conversations. The D Dock team of Al and Dean, along with Joe and Rick, came in second. Not bad, guys! After any race, there has to be food, drink, and socializing!